There is a lot going on in the monitor market these days but, if the stats are to be believed, most of us are content with fairly standard functional monitors that do the job they are designed for. ASUS are no strangers to giving us what we want in this market place. The VX239H is an IPS backed 1080p monitor wrapped up in a 23″ screen. It doesn’t feature an array of gaming features but instead it focuses on delivering good all round image quality at an affordable price. The stand out aspect of this monitor is it’s overall simplicity. The super thin bezels conspire to form a “frameless” design and its true to say that it is a lovely looking piece of kit. Of course no monitor literally has no frame, else the panel would fall out, but this is about as narrow as it gets. Connectivity is adequate, the target audience here will be hooking up an HDMI cable, no need to worry about higher bandwidth options. You’ll find HDMI/MHL inputs, and also a VGA input making this suitable for those running older PCs or laptops. I would feel let down by the lack of height adjustment in the stand, and there is no VESA mounting option either if you want to hook it up to a monitor arm. But if this is not an issue for you, read on! The IPS panel provides great image quality over its cheaper rival, the TN panel. The VX239H offers crispness and outstanding colour reproduction that you won’t find in cheaper models. It’s also worth noting that the quoted 5ms response time is within the tolerance for good gaming performance. Sure, this is one area the TN based screens will typically win in but the modern IPS monitors are well within the zone. We give the ASUS VX239H a 4.5 out of 5 rating. Want to know what existing owners of the monitor think? You can read real user reviews here. 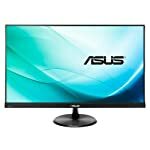 Should I buy the ASUS VX239H? A compact AH-IPS screen. Good all-rounder at a reasonable price, if your looking at this end of the market then do consider going for these higher quality panels. If you are having some doubts about this purchase then why not read some real owner reviews and see what other buyers think. Welcome to the ASUS VX239H FAQ. This section attempts to answer common questions you may have, please get in touch if you have any more queries or if you think our answers need updating. There is no VESA mounting compatibility, you’re stuck with the stand unless you are handy enough to do something bespoke.